Summary: For most Canadians, buying a car is a major expense. From the initial car purchase to buying winter tires to adding car upgrades and finally, buying car insurance. It all adds up and if you don’t shop around for cheap car insurance, the costs can be astronomical. Car insurance is mandatory, by law, regardless of where you live in Canada. If you are caught driving without car insurance, penalties can be hefty and harsh, from huge fines to license suspension, or both. Accidents happen, and in the event that you are in a car accident, having car insurance will ensure that you, the driver, your occupants, and pedestrians, are covered. Coverage also can be provided for the car itself. As well, in order to get your car registered, proof of insurance must be provided. However, insurance is expensive. It is worth looking around for cheapest car insurance to help manage your costs. Depending on what province you live in, car insurance rates will vary. British Columbia, Saskatchewan and Manitoba rely on provincial run coverage while the rest of the country is privately insured via independent insurance companies. In provinces where you have a choice of providers, it’s easier to shop around for cheap auto insurance. Liability insurance is the only mandatory insurance coverage required. This type of insurance will protect others from damage that may be caused by a driver while operating a vehicle, including any losses, injury, death and property damage. Liability insurance in Canada also includes coverage to protect drivers against financial losses they might suffer due to their own medical expenses, and the loss of income that they could incur if injured in an automobile accident while driving. This portion of insurance coverage is referred to as accident benefits, and can be claimed even in the case of an at-fault accident. In your hunt for auto insurance, do not skimp on getting robust liability insurance, especially if you have a long daily commute. Collision coverage provides financial compensation for damages that occur to the vehicle due to a collision or accident. Collisions include accidents with another vehicle or a stationary object. Collision insurance is often an expensive component of any insurance policy, and varies depending on the vehicle, driver and many other factors. Comprehensive insurance coverage protects drivers against loss from events that aren’t directly related to the operation of the vehicle or the driver’s actions. This includes loss due to the actions of others, such as vandalism or theft (including the damage caused by thieves entering the vehicle). Coverage for environmental occurrences causing damage are also included under comprehensive insurance, including windstorms, floods, hail, etc. Additionally, in the case that a vehicle is damaged by a flying object (e.g. debris from another vehicle) while parked, comprehensive policies can protect the driver from financial liability. Comprehensive insurance is often reasonably priced and provides peace of mind against unfortunate, uncontrollable occurrences. Although it’s not mandatory, it is a cheap car insurance component worth having. Cheap car insurance is hard to find in Ontario. This province has the highest annual car insurance rates in Canada with drivers paying on average $1,920 per year. 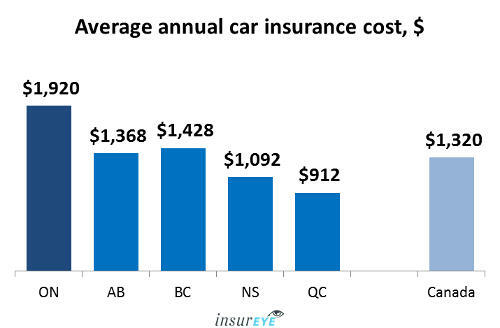 British Columbia is the second highest, with an average annual insurance cost of $1,428. Alberta falls in third place, with an average annual insurance cost of $1,368. Nova Scotia and Quebec are in fourth and fifth place. Quebec, as a rule, has more affordable car insurance premiums since the health part of the insurance (e.g. bodily injuries) is covered by the government. If you are looking to save by getting cheap auto insurance, take the time to shop around and get quotes from as many insurers as possible. Different carriers have different incentives for drivers, depending on your experience and driving history. It’s worth shopping around, as you can save quite a bit of money when you find the right incentive program. It’s quick and easy to compare quotes when you use InsurEye. With our comparison tool you can compare quotes from 25 different insurance companies, ensuring you find the best deal possible on your car insurance. InsurEye is an info hub devoted to insurance in Canada.